I woke up this morning to another alligator story coming out of Florida. A woman swimming in the Wekiva, or Wekiwa, River in central Florida had her arm bitten off by a gator. Subsequently the gator was found and killed. First of all, swimming in fresh water in Florida puts you near gators no matter where you swim. Alligators are everywhere in Florida. I once saw one on the side of the road, at a busy intersection while driving home from the grocery store. I’m sure Floridians have many stories of alligator sightings. And anyone who lives in the state knows that they are in all the rivers, lakes and ponds, as well as occasionally along the side of the road. 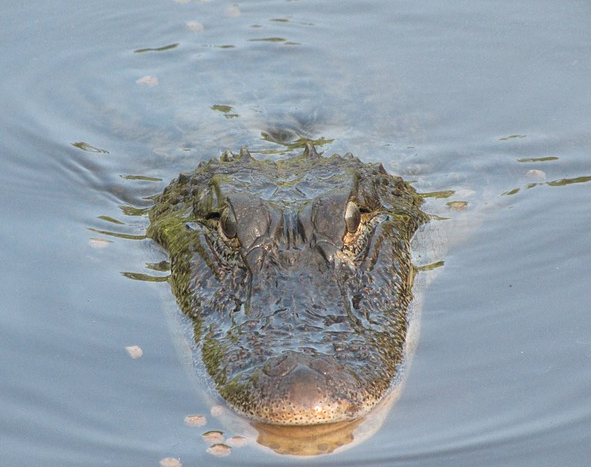 This alligator story says that the woman was swimming in a busy area – Wekiwa Springs maybe?, but then she decided to swim off to a less crowded spot, which is where the alligator got her. The gator did not come after her in the crowd of people, she swam into his space and he did what a gator does. Don’t get me wrong, I don’t like gators. They are creepy, and they are killers. But swimming in water where they live (and that is ALL water in Florida – except the ocean) is taking a chance. When I lived in Florida there were many sad stories of people and animals being dragged into the water, or bitten while swimming and killed. A little girl was grabbed as she walked along a pond behind her home. Dogs are are killed this way too. Gators can leap up from under the water and grab dinner from the shore. I remember the story of two teens swimming at night in a river. One was killed by a gator. Usually people don’t live when a gator decides to attack. This woman was lucky to have only lost an arm. The story doesn’t say how big the gator was, but Fox news said it was 8 feet long. Alligators grab their prey and then take it under water and roll until it drowns. That is how they eat. Like sharks, they don’t target people, but if you are in their space, you could be dinner. They really don’t care. One place I will never live is on fresh water in Florida. And if you visit the state, keep this information in mind. And don’t get near gators on land either – they can run as fast as a horse in a straight line. I remember being told to zig-zag if one comes after me, because they can’t turn fast. PigLove, you are so right – view Florida from indoors only!